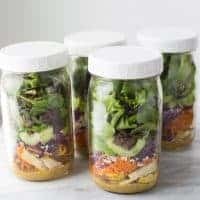 Thai Chicken & Sweet Potato Mason Jar Salads! Easy, delicious and prep for meal prep for the week. Are you into meal prep? It is a whole new world to me and I’m loving it! My husband and I have been trying to get better at prepping healthy lunches at the beginning of the week so we can eat healthier on busy weekdays. 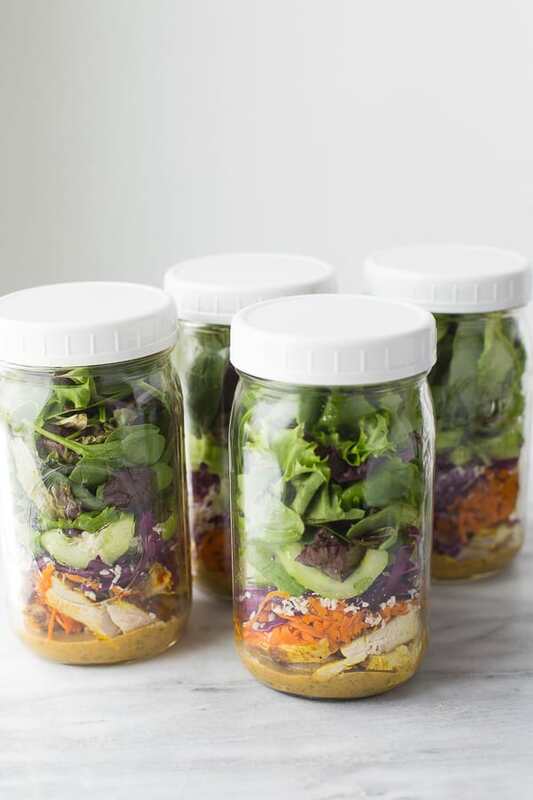 These Thai Chicken & Sweet Potato Mason Jar Salads are our favorite salads to make-ahead! The flavors are out-of-this-world delicious thanks to a delicious Almond Butter Thai Dressing. 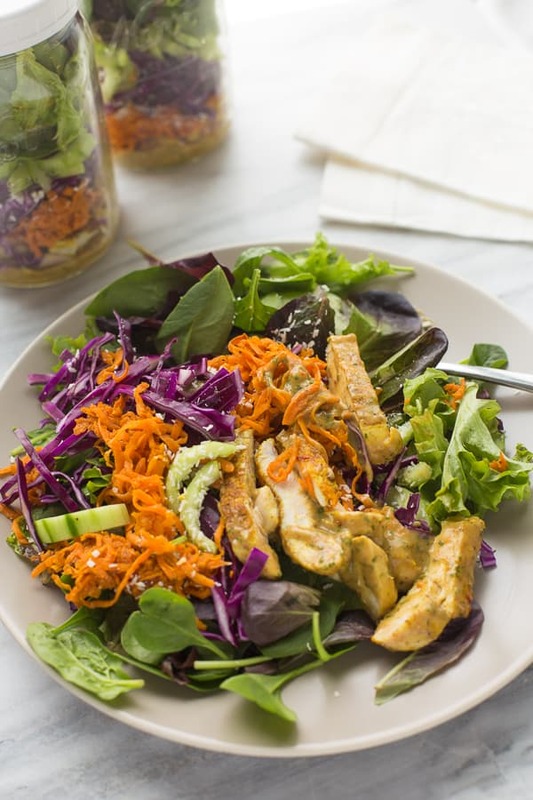 These salads also have grilled or sauteed curried chicken, sauteed sweet potatoes, red cabbage, thinly sliced cucumber, unsweetened shredded coconut and greens. This combination makes for one colorful and satisfying salad! I actually had a salad very similar to this at an airport of all places and it was so good I wanted to recreate it at home- mason jar style! The trick with mason jar salads is to put the dressing at the bottom, followed by the protein or sturdy vegetables that won’t get wilted. The delicate greens are added last so they stay fresh and crisp away from the dressing. 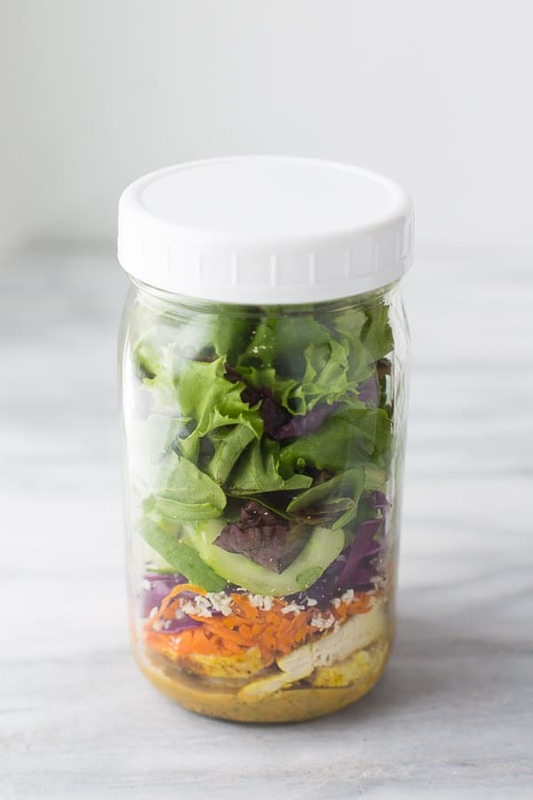 I like to make these salads in wide-mouth mason jars with these plastic lids. One you’ve made the salads they will keep for up to 4 days so lunch is ready to go. Just empty the salad out onto a plate and mix everything with the dressing to serve. Perfect for my husband to grab on his way out the door to work – and perfect for me to be able to eat lunch with 2 little boys running around! For the Chicken: Heat the avocado oil in a medium skillet over medium-high heat. Season both sides of the chicken with salt, pepper and curry powder. Cook the chicken on each side for 4-5 minutes, until cooked through. Let cool, then slice into thin strips. For the Sweet Potatoes: Heat the avocado oil in a medium skillet over medium heat (I like to use cast iron or non-stick for this). 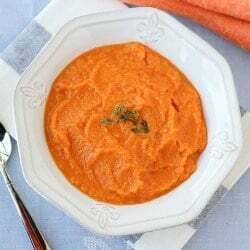 Add the sweet potatoes, season with salt and pepper and cook for 7-9 minutes until soft, stirring often. For the dressing: Place all the ingredients except the olive oil in a small food processor. Process until smooth. With the processor running, slowly add the olive oil until incorporated. Alternatively you can add all the ingredients to a jar and shake to combine. To Assemble the salads: Divide the salad dressing up evenly between 4 large mason jars. Divide the chicken up and add on top of the dressing. Add the vegetables in this order: sweet potatoes, red cabbage, coconut, cucumbers, greens. Add lids (I like these plastic mason jar lids) and refrigerate for up to 4 days. To serve simply pour the salad onto a plate and mix with the dressing. Enjoy! Try these Healthy Mason Jar Taco Salads from Food Faith Fitness for another great make-ahead lunch! This is such a great combo of flavors! 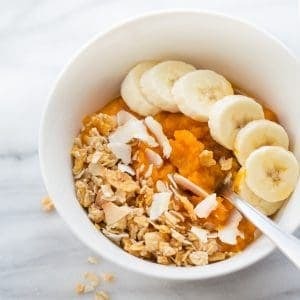 I love the sweet potato addition–sure to fill me up! I love the dressing. I haven’t made one with almond butter yet, looking forward to trying! Those veggies look great! 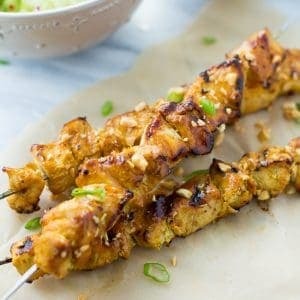 Great make ahead meal idea! Tried to sign up to get your recipes… said I’ve signed up too many times, something like that…I rarely sign up for anything and today is the first time I tried signing up on this site. Let me look into it! Sorry for the trouble! It should be working now! If it still doesn’t work email me at erin@meaningfuleats.com and I’ll sign you up. So glad you want to follow along! Hi, your website won’t allow me to sign up either. It says you have too many recent requests. Any chance I can be added? Thanks! I just had my husband (software developer) take a look and it should be working now! If you still have trouble email me at erin@meaningfuleats.com and I’ll sign you up. So glad you want to subscribe! Curious if the salad you got was in Denver? Got that salad yesterday and have been searching Pinterest for a similar salad. Yes I got it in Denver from Modern Market! Such a good combination of flavors! this looks wonderful NEVER thought about design on the bottom…. what an excellent idea! As much as I love olive oil, since it is asian influence, what about coconut oil… although once refrigerated ( Im answering my own question) becomes solid, can’t wait to make!, thank you!